My 1972 Yamaha LS2 is a 1972 Yahama LS2 100 street bike that looks nice for its age considering that it's a 40 year old motorcycle. The Ls2 is just about all original making it a very desirable vintage bike. 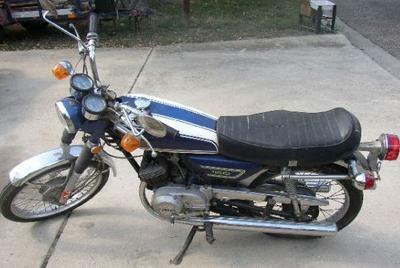 The old Yamaha was put in a shed back in 1985 and I bought it two years ago. I learned FAST that I'm just too old to play with it. I have the engine guard but haven't mounted it. old Yamaha motorcycles and get ready to be hooked! it has a new motorcycle battery that sparks on both cylinders. The left cylinder has 125 lbs of compression and the right cylinder has 100 lbs of compression. It will fire on the left cylinder but not on the right. I only had the plug in finger tight and I have not tried it again. You can check out the specs of the 1972 LS2 here or access the LS2 1972 USA parts fiche schematic diagrams here. If you are aware of any problems that are known to be associated with the 1972 LS2 or if you would like to express your opinion or write a review on this old bike, you are more than welcome to do so using the space below that has been provided by GoGoCycles Used Motorcycles for Sale. I feel fortunate to own a piece of Yamaha motorcycle history. GoGocycles appreciates your visit and hopes that you enjoyed seeing the picture of the 1972 Yamaha LS2 shared by this visitor. I bought mine in 1976 for around $600 in Florida. Back then when you turned 15 and got a learners permit, you were limited in when you could drive a car but there were no limits or extra license needed for a motorcycle. Loved this bike, put around 4000 miles on it. Drove it daily until I got a car. As I remember, it got to 60 mph real fast but you couldn't drive it farther than about 30 miles full speed before the plugs fouled. I would love to have another. I have a 1972 LS2 that comes with the the original tool kit and owner's shop manual that has just 1800 original miles in excellent shape. My classified for the LS2 is on Craigslist Boise, ID Idaho. I got one off of Craigslist for $500.00. It had some serious Gremlins in the electrical. I blame that on the previous owner. I put new Points, condensers, coils/wires/plugs, battery, removed the switches(blinkers), wired for night driving, disabled the oil pump (premix 5oz to a gallon/PREMIUM), rebuilt Carbs. Holy Smokes!!! I love my bike! it has been Powder coated black, red wheel, and turned into a Café Racer. "Make it your own!" So much FUN... a total head turner. Not to mention that 1972 was the only year it was produced for the U.S. market. If you need parts check out HVC Cycles. I have a LS2 that I bought it from its original owner in 1976. The dent in the fuel tank stems from the turn signal. It needs to be bent and pushed away so it swings clear of the tank with a full swing of the handlebars left to right. I had my bike running a year ago but it suddenly died. I found a local high school kid looking for a senior project for auto shop and let him work on it. The compression is really low on both cylinders with this bike and it needs a total rebuild. I can't believe I can't find the parts to make the repairs. I thought I hit the jackpot on Ebay, but found everything but the parts that I need to fix it. My LS2 is 100% complete! It's not missing one bolt including the chain guard. The turn signals make that distinctive clicking sound when activated. That said, I'd really want it repaired to where it once was. After watching American Restoration a thousand times, I am optimistic it can happen unless that show is rigged LOL). The mechanic doesn't see the point in fixing it as I mentioned he's in high school so he doesn't know the value of sentimentality. As the writer above said, the bike tops out at around 63 mph and I'd love to experience that thrill around town one more time. It's a great bike for zipping around town but it's not built for the parkway or the long haul. It gets over 100 mpg and the insurance is under 200 dollars a year so what's not to like? This model was marketed as a "his and hers" bike. The other paint color option was maroon and white if I remember correctly. As a 15 year old, it was the perfect starter bike coming from a mo-oed. Back in the 1970's you could actually ride a moped without a helmet, license plate or motorcycle insurance if you were over 15! Can you believe it? I had it made! LOL. This was in New Jersey no less! But, of course, the mothers got together and another one of our liberties were taken away, the first of many. Luckily, I was well past 18 when the laws were enacted but it essentially crushed the moped industry in NJ. My best advice is to buy one of these bikes if you ever come across one for sale. Twin 50 cc's..100 cc ..1 down 4 up...fun drive...ahh..can't wait!